Prepare your work surface and take precaution. Use newspaper to protect your work table and easy clean up. make sure to wear latex free gloves to protect your skin and a dust mask to protect you lungs. With a pencil draw out the football design of your CHOICE AND select tile colors. You can coordinate to your favorite sports team. Nip and glue down tile to your tray design. Make sure to leave 1/8 to ¼ inch of space in between tile. Let the glue dry for 15-20min when done. In a separate plastic cup, mix one cup of grout with water. Add very small amounts of water, a little goes a long way. Mix until a pancake mix consistency. Mix with plastic spoon or stirring stick. Make sure you are wearing a dust mask. Pour grout mixture on top of tile and smooth out in between tile and along the edges. Make sure you are wearing latex free gloves. it is better to smooth out grout with your hands. With a damp sponge or paper towel, wipe away excess grout. It does not need to be wiped clean yet, we will do that once grout dries. Time to paint the outside and handles of the tray. Choose a paint color of your choice. set aside and wait until dry. Once paint and grout are dry, wipe mosaic clean with a damp sponge or paper towel. Let it set over night. 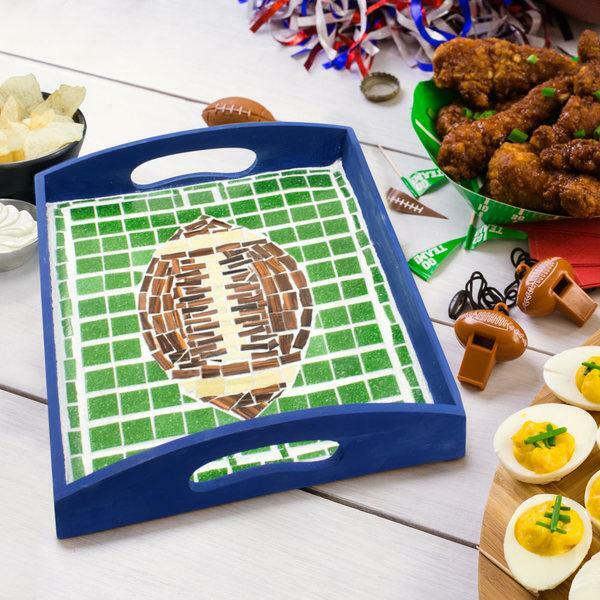 Now you have the perfect serving tray for your Superbowl festivities. 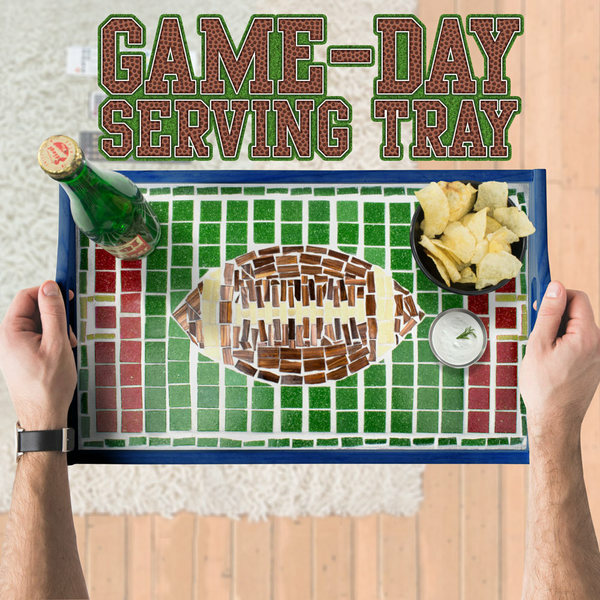 You can mosaic a serving tray with any sports team deign you like. the possibilities are endless. have fun crafting!